Track and field events, including shot put and discus, originated in Greece over 2,000 years ago. As track and field events evolved, the hammer and javelin have been added to the list of throwing sports. Throwing athletes may not look like they have a lot of strength, especially shot putters who are generally tall but heavy while javelin throwers who are very thin like runners. Training, no matter, requires a lot of repetitive motion. Therefore, athletes, especially young ones "are at risk from over-use injury to immature tissues, especially in the vicinity of upper limb joints, with the lower back and knees also being areas of concern," according to the Department of Education and Training School Sport Unit (DET). The best way to avoid throwing sport injuries is to limit or restrict the number of throws an athlete makes during each training session. "Most training should also be sub-maximal," advises the DET. Not only do throwing athletes have to ensure proper technique in order to avoid injuring themselves, but because an errant throw is always possible, they must also be mindful of the spectators. "Deaths have been recorded in the past among throwers and spectators," reports Williams Byron Pendleton. "Throwing is like crossing the street - no one would cross a busy street blindly without looking both ways." Shot put is one of the original throwing events and the sport has moved from a very basic action to one that is now tailored to each athlete. There are many different styles of throwing used in shot put, with the 180-degree shot, developed by Perry O'Brien, being more effective than the originally used 90-degree action. O'Brien discovered the longer he pushed, the faster the shot would travel. The shoulders and arms are at particular risk of injury for shot putters. "Keep your elbows parallel to the ground and the shot tucked into your neck. This will help prevent injury to your shoulder and elbow," reports the Saskatchewan Grassroots Program. In an effort to avoid injury, shot putters must use proper technique, but also do a lot of arm, waist, hamstring, hip and quadriceps stretching, as those are the areas used most by these athletes. Other things to consider include the physical properties of the shot - it should be made of brass or iron. The shot should also not be too heavy for the thrower. Always throw on a flat, dry surface - this will help avoid ankle injuries. The javelin, which has its roots in hunting and warfare, is a spear-like object made of metal, fibreglass or carbon fibre. Although the sport has only been a part of the Summer Olympics since 1908, the javelin was a part of the ancient Olympics, however, the object was to throw at a target versus distance, which is now the purpose. Learning the proper throwing technique will go a long way towards avoiding injuring and increasing distance thrown. The thrower must throw over the shoulder or upper part of the throwing arm, while leading and throwing with the elbows in order to avoid injury. A javelin must never be slung or hurled. 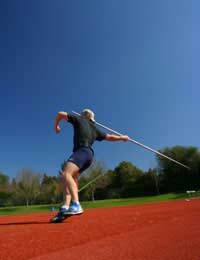 Like in shot put, the correctly weighted javelin must be used.